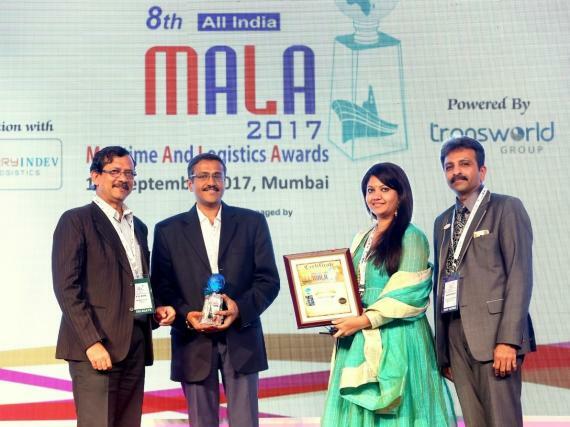 Earlier this month, Procam Logistics (members in India) were awarded 'Project Mover of the Year' at the 8th edition of the All India 2017 Maritime and Logistics Awards (MALA) in Mumbai. MALA has emerged as the authoritative recognition of quality service, best practices and innovation in the various segments of the maritime and logistics sectors in India. Over 30 categories are scrutinised by an eminent jury drawn from various segments of the industry, comprising some of the leading lights of the fraternity. The category of 'Project Mover of The Year' was judged on performance and key parameters such as type and size of cargo handled, year-on-year growth, number of projects, number of equipment owned and customer satisfaction. The photo on the right shows Director, Mr. Nilesh Sinha and Manager, Ms. Sanjna Vardhan receiving the award for Procam Logistics from Mr. A.K. Bose from the Mumbai Port Trust and Mr. Ashish Sheth of Sarjak Container Lines. The PCN Head Office is very pleased to have the MALA Project Mover of the Year as our members in India! Congratulations to all at Procam on this excellent recognition of their project cargo expertise. Procam Logistics is an asset based, integrated logistics service provider established in 2010 with offices in Mumbai, Gurgaon, Delhi, Kolkata, Chennai, Bangalore, Hyderabad and Vadodara in India. They specialise in project cargo management, heavy cargo & ODC transportation, installation, custom clearance and providing indirect tax consulting services. They have their own fleet of 120 axles including Goldhofer hydraulic axles and 2 U.S. Lift System, 400mt capacity, 4-point lift jack system.